*A last choice or ditch effort, an expedient solution tried if all else fails? *A place of aid and refuge? *A popular, luxurious place to visit? *An incredible course of action — say, a last stand or final opportunity of appeal? Obviously it means all of the above. One of its more obscure meanings, though, is a reversion to a former state, condition or habit, whether good or bad or in between. 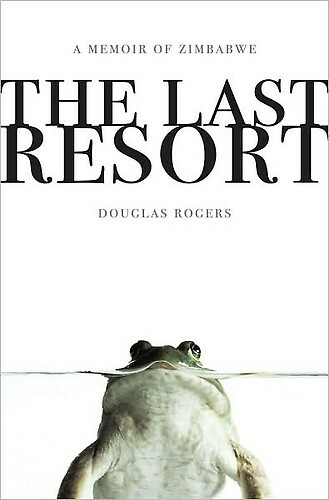 All of these meanings, and especially the last, kept me reading Douglas Rogers’ The Last Resort, a memoir of his aging parents and their survival in their long declining and failing country and homeland, Zimbabwe. From the novel’s opening, readers realize a kind of “line in the sand” has been drawn by Rogers’ parents. They make plans to hang on to their home (a game farm and lodge named Drifters) in ways that neither they nor we the readers know to expect, as hard as they and we the readers try to determine and guess. Once the foreign tourists stop arriving in the wake of continued white commercial farm invasions by the government and the sponsored war veterans and militas, as well as the national, social, economic, and political upheavals that erupt, Rogers’ parents Lyn and Rosalind and their plans shift into gear, changing strategies — first to accommodate displaced local white farmers and then fugitive opposition MDC party activists. All the while, they cope with ordinary every day demands for food, fuel, electricity, communication, security, and news, among other things. Yet, they live for the pleasures too of their neighbors’ crops and returned livestock, sports, braais, marriages, births, and the fortunes of family, friends, neighbors, employees and partners. Drifters even becomes for a time a brothel to serve, among others, groups of corrupt and powerful local ruling party politicians, and it becomes a popular watering hole for illicit diamond dealers. As rule of law wanes, then, ordinary people, Rogers’ parents included, prove to be extraordinarily resilient, creative, courageous, and perversely wise. Their story and those of others are all recounted by Rogers most often in a humorously moving, compassionate, and yet disarmingly honest manner. Many Americans by now know of the tragedy of Zimbabwe and particularly of the tryanny of Robert Mugabe and his ZANU-PF ruling party. Rogers’ cast of characters and the bizarre course of events on his parents’ farm and lodge resound with much of the darkly cynical and disgustingly brutal stories known to many of us who’ve followed the news. And yet, the characters and their stories are strangely funny and refreshingly memorable as well. The patience, tenacity, and of Rogers’ parents and their community of friends and neighbors revert to and call upon are unshakeable and unmistakable. They all find ways to survive and even thrive in a country where formal economic activities, lawful property ownership, and local currency have all precipitously fallen away (for instance, Zimbabwean inflation as recently as 2008, running in the millions). My comments here all the beg the question. Zimbabweans in Zimbabwe may still live varied, full, rich lives that outsiders cannot always see. On a personal note: more than any other work on Zimbabwe in recent years, Douglas Rogers makes me wish to return there to visit, and to shed some of the curiously displaced, in-exile mindset I’ve always had as a child born of diplomats. I look to gain another mindset, not of my childhood, but somehow a more re-connected one with my past life. (For my parents, siblings and I, as well as in-laws, have watched Zimbabwe from a far for years, having made our home there and in neighboring countries of the region for so long (from 1971—2008); we remember all too well what was and what has happened in recent years there.) I do wonder if Zimbabwean friends of mine on Facebook, some of them now citizens or residents of other countries, and others still home in Zim, to some degree feel some disconnect or separation as I do. Zimbabwe, and my few friends there, alive and gone, in touch or out of touch, still stay with me, and maybe I with them, here in South Florida.